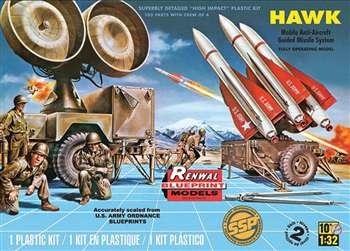 Cold War Raytheon medium range surface-to-air missile battery - Selected Subjects Program vintage reissue kit...…….. Cold War Raytheon medium range surface-to-air missile battery - Selected Subjects Program vintage reissue kit. 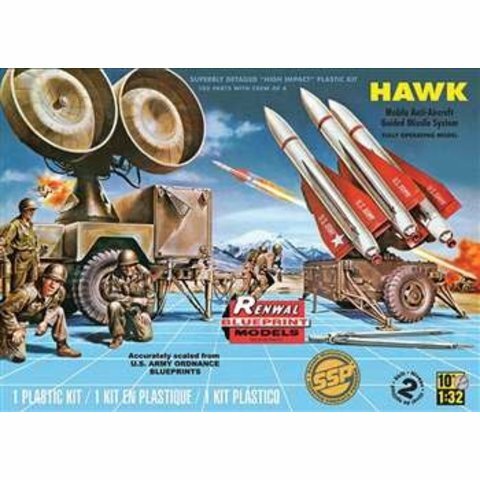 Includes 2-wheel mobile radar trailer (with rotatable antennae), 2-wheel missile trailer (with articulated stabilizer legs and positionable launch rack), 4 crew figures and 3 Hawk MIM-23 missiles (each with movable control surfaces. Ex-Renwal mold. Decals and painting notes for a typical US Army scheme.